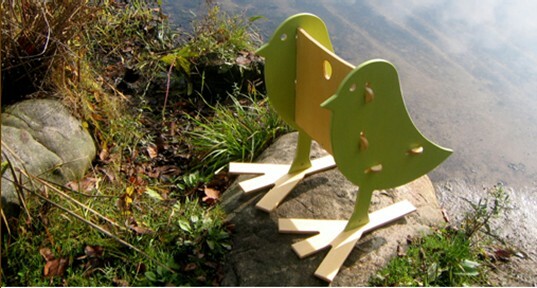 Roebuck Studio is a children’s furniture design and manufacturing company chock-full of imagination and whimsy. Roebuck Studio boasts that they “Make furniture for your kids that fit with your Eames chair.” They’re not kidding either; all of their pieces are beautiful and modern. The designs are creative enough for your child, yet every piece has such clean lines and great colors that you can implement them into your living space with confidence that they will mesh with your existing furniture and decor. My absolute favorite Roebuck Studio design is the adorable Chick Chair seen above. 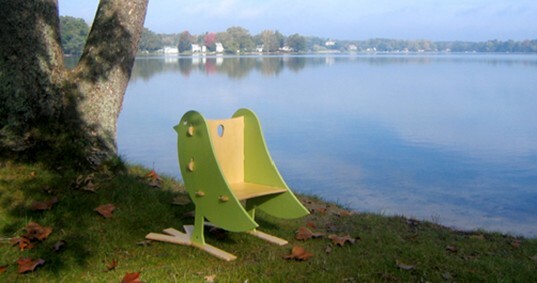 The Chick Chair, inspired by what else, baby chicks, is for little ones ages 2 through 6. Made with eco-friendly birch plywood and a child safe shellac finish, this chair comes in either a clear finish, a lovely color choice (orange, green, white, black, red, or blue), or a combination of clear and color. Plus the chair comes flat packed to save on shipping, and easy fitted slots make assembly a snap. Below is a seat view of this super cute chair. Above is the totally unique Frog Cabinet. This cabinet is made with the same care as the Chick Chair and can be mounted at any height. Roebuck Studio suggests a variety of uses for this cabinet: for CD storage, above a changing table for baby supply storage, or at a lower height for a small child’s toy storage. I think it would be really sweet in your little one’s bathroom for storing towels and extra bubble bath. Roebuck Studio uses Baltic birch plywood because of its lighter eco footprint and because less glue is needed for birch panels. Traditional shellac is used for finishing Roebuck Studio pieces. This is the same shellac you’d see on store bought apples – meaning if you have a child who decides to taste his chair, it won’t be a tasty treat, but it won’t be dangerous either. Other sustainable efforts from this company include reuse of scrap materials and maximizing yield to reduce waste. Read more about their earth-friendly material choices. I’ll leave you with a snapshot of the Trillium Rocker – another cool design from Roebuck Studio. If you look below the chair image you’ll see the color choices offered for all pieces. Visit Roebuck Studio to see many more unique items such as tables, pet bowl holders, and more storage options. 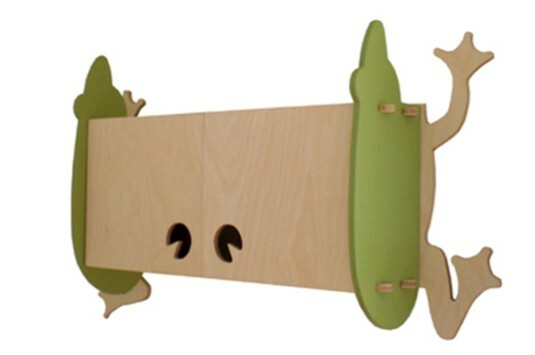 Roebuck Studio is a children�s furniture design and manufacturing company chock-full of imagination and whimsy. Roebuck Studio boasts that they "Make furniture for your kids that fit with your Eames chair." They're not kidding either; all of their pieces are beautiful and modern. The designs are creative enough for your child, yet every piece has such clean lines and great colors that you can implement them into your living space with confidence that they will mesh with your existing furniture and decor.